This annual “limited use” license is intended for Professional Crafters and photographers NOT FOR DESIGNERS, who are producing a digital downloadable finished product. If you sell your product as a printed finished product please see our Printed Angel Use License. Use our graphics to create a new product - i.e. printables, hybrid craft, card, etc. which then may be sold for profit. All graphics remain the property of Nitwit Collections™, as this only grants you a non-exclusive license to use our graphics. Republish, resell or include these graphics in any software. You may not have your creations as "Freebies" or offer them as for sale as Free. Make and sell decoupage sheets, rubber stamps, scrapbook kits, digital embroidery designs, websites, blog templates, etc. for sale or any other distribution. Make our graphics into PSP tubes, Photoshop brushes or redistribute them in any way. Make templates, quick pages, etc. for profit or distribution in any way. You must not make anything from our graphics or use our graphics in any commercial production. It is fine for your customer to sell your creation as a finished, printed item only. They cannot resell your creation as a downloadable product. (i.e. no third party sales). 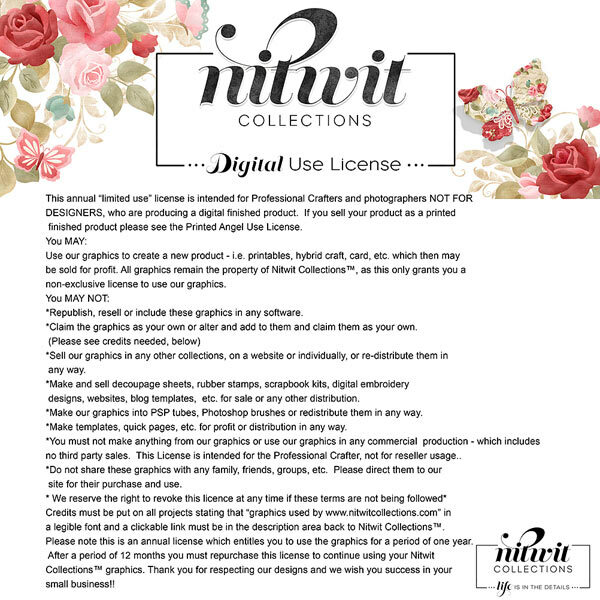 Credits must be put on all projects stating that “graphics used by www.nitwitcollections.com” in a legible font and a clickable link must be in the description area of any item using our graphics, back to Nitwit Collections™.